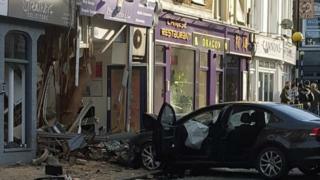 A car containing what is thought to be a large drugs haul has crashed into two shops in north London, causing extensive damage. It happened in Park Road, Crouch End. Police said officers in an unmarked car had tried to stop the driver in nearby Muswell Hill at about 10:20 GMT. He failed to stop and later smashed into the frontages of Mr Dweeb Computer Repairs and Streathers Solicitors. The driver fled the scene but was later held on suspicion of drugs offences. The Metropolitan Police said officers were not pursuing the vehicle at the time of the crash. There were no reported injuries. Road closures remain in place.